For my students looking for a DVD to practice at home, I would recommend purchasing my Belly Dance for Every Body - Level 1 series of DVDs. There are currently three volumes. Horizontal Circles, Sagittal Circles and Vertical Circles. I plan to release the first volume of Level 2 in early 2015 which will cover the balance of the moves taught in Beginner. Get the DVD as soon as it is released! For more information on Beginning Belly Dance: Sagittal Circles, please visit the Belly Dance for Every Body Level 1 Sagittal Circles page. Kansas Residents will be charged 8.80% sales tax. For international orders, please email me for a shipping quote. If you are looking for something by a different instructor I have listed some suggestions below. If I had to pick a favorite out of this category I would be hard pressed. I would recommend the Basic Workout by Princess Farhana and the DVDs by the Neena and Veena as the most useful for beginner level students. Basic Workout (Princess Farhana) – in spite of its name, this is not a workout DVD. It is however a very good instructional DVD. Princess Farhana breaks down several beginner level moves and drills them. The sections beginners might have difficulty with are the arm movements layered with hip lift shimmies, the hip drop kick and the horizontal and vertical figure 8s (I introduce all of these concepts in intermediate). Her undulations section is actually sagital hip and rib cage circles, though she does add stepping with them. She calls these moves camel and then rib cage camel. Belly Dance Fitness for Beginners: Arms, Abs, Hips, Buns & Thighs – two basic workouts from the Bellytwins, each about a half hour. Belly Dance Fitness for Beginners: Slim Down – a basic half hour workout with the Bellytwins. 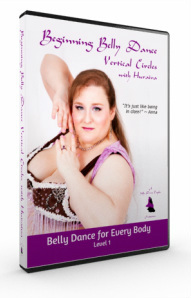 Bellydance Fitness for Weight Loss: Cardio Shimmy (Rania) – bonus features are a 10 minute “waist cincher” workout (rib and hip slides, horizontal and vertical hip figure 8, up to down undulations and vertical rib cage circles) and two costumed performances. The workout uses Egyptian shimmy, shoulder shimmy, choochoo shimmy. Most of the moves are taught in my beginner level classes, the exceptions being the Egyptian shimmy and the gush (King Tut walk). Also, Rania does not name her hip shimmy, so beginner level students might not realize it is different from the hip lift shimmy taught in class. Beginner level students could use this video if they substituted the hip lift shimmy for the Egyptian shimmy. Like all of her DVDs, this one was recorded from the front with Rania and four other dancers. It makes right and left a bit confusing since you have to mirror the dancers or use the opposite side. Bellydance 101 (Amira) - This is generally a good DVD for beginners. One thing that I didn't care for is the instruction is all done through voice over rather than by Amira speaking while dancing. Belly Dance for Beginners (Leila) - The material on this DVD is beginner appropriate. However, it is Egyptian style which is slightly different from the Vintage Oriental style that I teach in my classes. This should not prevent you from working with the DVD. Discover Belly Dance: Basic Dance (Neena and Veena) – beginning belly dance technique includes a basic choreography. & Discover Belly Dance: Beyond Basic Dance – beginning and intermediate belly dance technique, including a short intermediate choreography.